You need to create and upload EXCEL file in Windows Azure Web Role. Since there is no MS Office present on AZURE VM so you cannot use Office InterOP Dll. So you are left with option of Open XML SDK to create and update Excel file. Upload updated excel in Azure BLOB. I have created local storage called ExcelStorage. We will download Template Excel file in this local memory to update the records. 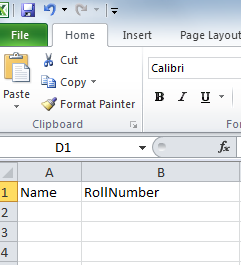 There are two columns in the excel file. I am going to update these two columns. You can have any number of columns. I have uploaded this excel file manually using Storage Explorer tool. 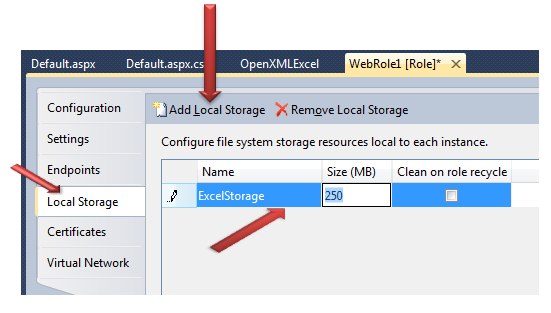 Creating reference of local storage ExcelStorage . In previous step we created this local storage. Debugmodestreaming is name of the container. Reading excel template file TestBLOB.xlsx and saving it to file called dj.xlsx on web role local storage. I have created a class called Student and some dummy data to be saved in the Excel file. Only one point to be noted is, we are opening file to write from local storage. Dj.xlsx is the file we saved on local storage from BLOB. Again we are reading updated excel sheet from local storage and uploading it to BLOB. Make sure content type is set properly. This is all we need to do to work with Excel file in Windows Azure. is it possible to updating EXCEL file in Windows Azure Web Role using “Microsoft.Office.Interop.Excel”.